Click here to watch the third video on trust and credibility. We've looked at several strategies to help you bring Reiki practice to new people. Now let's pull it all together so you can start having better results when you speak to people about Reiki practice. Make sure the sound is turned up on your computer or device. If you still can't hear, check the sound icon in the left side of the bar that appears across the bottom of the video after you start play. Was the video helpful? If so, please use the button below to share it on Facebook and help more people help more people with Reiki! Would you like to receive more helpful, credible information to support your Reiki practice? Please sign up for ReikiUpdate, my free monthly e-newsletter! Now watch Helping More People with Reiki Video Five ». Could you please share the links to the other three videos? I do not know where to find them. Thank you. Marie, please scroll to the bottom of the page and click Helping More People under Reiki Resources. That will take you to the first video in the series and you can continue from there. Pamela it just sounds great I can t wait to have my class with you but I don t think I can wait 6 months or a year to take the 2ond and master level class It is to long to wait ! Thank you for your free videos. They are very encouraging and supportive. Unfortunately, even with both sound bars at their max, the sound was too low. I could hear but strained to hear. I’m so sorry you had trouble with the sound, Jacque. It varies among computers. Did you try using headphones? Very nice videos. I am sure many practitioners will be helped by these. Great job Pamela. I have been practicing Reiki for 25 years and have passed through these hurdles so I can say it would be great having had these in my earlier stages. I recommend all practitioners watch these videos. Thank you, Brett. That’s exactly my goal, to help Reiki professionals learn what we learned during years in the School of Hard Knocks 🙂 so they can bring the practice to more people sooner. Please share the videos in your Reiki community. First off I would like to say thank-you for your Reiki Practice, you are very encouraging to others. I live in Victoria B.C. Canada and I have a very busy mainstream practice. I volunteer at Our Place Society, it is a homeless shelter. OPS is the only one of its kind in B.C. I have been there for a yr coming up in Jan. and I treat about 150 street people a month with various different needs. My clients find that Reiki is very helpful in relieving stress and trauma in their bodies. When they get up from the session they feel so much better , very relaxed and pain free, which makes my heart sing as these folks have alot to face in their day to day life. I am also teaching them how to lay hands on them selves and they are quite successful at their Reiki practice. I work out in the streets and I am known as the Reiki lady , my street friends think nothing of coming up to me and asking for Reiki as they know it helps. I am quite comfortable about sharing Reiki and as i have the opportunity to do so ,it gets easier and easier to talk about . I find at this time in society that people are more open to this kind of healing and I would encourage others to step out and not to worry whether u will be accepted or not. I practice Reiki with people of different belief systems and have been able to get past words and help with Reiki. I work with animals also and have a few regular animal clients that see me often. Last weekend I went to a Animal Rescue Farm and did Reiki with 2 people, a horse, a pig and a rabbit. Everyone benefited from the Reiki. 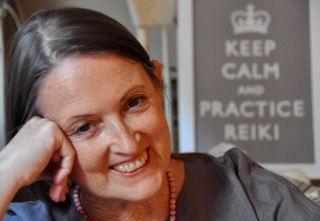 Thank-you so much Pamela for the work you do with Reiki…….. Thank you for your kind words and the beautiful service you are offering, Karen. I agree that the more we practice on ourselves and on others, the easier it becomes to talk about Reiki. And people who are in dire straights are often a bit more open to hearing about Reiki practice, especially if they have an opportunity to experience Reiki touch. Thank you Pamela – for these four videos. They reinforce my goals and aid me in working towards a more substantial practice. I also must share, I enjoyed the points on confidence, presentation skills and gumption – of which I am grateful to have all three of these in my tool box. I loved the “close your eyes and see where you’ll be in 6-12 months”. I went 12 months out and for me it will be very different. I’m a single mom who’s only child is a senior in high school. He will leave for College in August and by November of 2016 I envision myself involved in more activities that align with my passions versus ‘doing the mom things’ and living life according my son’s schedule :). This will involve spiritual classes and discussion groups, yoga, and definitely growing my Reiki client base. The video tips you are providing to this Reiki community will certainly help! Thank you again for your generousity! Hi Pamela, Great information and simple, I feel I have heard this all before but with a different approach for Reiki. I am about to join a health centre so this is good timing for me, and motivating to become more organised in how I talk to others about Reiki. Your info has also given me some ideas about talking to other health professional and those I already know. Thank you for putting these videos together for the Reiki community. Thank you for these videos. I just got a chance to access them and feel as though the steps I have been taking are in line with what you have expressed here. I am actively thinking 6-12 months ahead, seeing and feeling my practice grow. I appreciate that you remind us that you started somewhere other than on the top of your game with an international following. That is something that is easy for your followers to forget. I appreciate your continued guidance and encouragement and am looking forward to bringing my practice to more people who will benefit. Thank you Pamela for these helpful videos and tips ! As a newly attuned Reiki 2 channel , my passion for helping others and the healing energy of reiki has grown so much . I practice self reiki daily and on friends & family . I have done volunteer work and have participated in reiki apprenticeship clinics in my area . Most of these are held in metaphysical type stores , which I have a respect for , but I feel for some who could really benefit , that may be a ” turn-off ” . I am currently working as a hairdresser but would like to increase my knowledge and training in Reiki . In my area , that’s very hard to find . What are your suggestions for someone like myself ? Thank you again ! I appreciate you . Once again, Pamela, I say THANK YOU to you for your clear, concise, practical advice!! Thank you Pamela, I have already got so much out of your videos, Hopping I can spread the word as you are doing ?? This was my favorite one of the series so far. Loved feeling your passion! My “mission” also is to bring the word and touch of Reiki to everyone in all settings, in every walk of life in a Grounded and Relate-able way. That was well explained Pamela, how you compared Reiki with New age minded people and the general public. I love how you told us to look 6-12 months ahead. I have many thoughts and affirmations of where I would be with my Reiki Practice. Going step by step makes it easy for me to visualize 6-12 months ahead. Thanks for your wonderful videos. They are really helpful, especially at this transition time in my life. Going step by step makes all the difference between disappointment and growth, Eileen. I’m very happy you are finding the videos useful. I have been trying to see 6-12 months ahead when I plan to retire, not wanting to sit around and do nothing. I have thought about volunteering and made some inquiries about different organizations. I did not consider widening my Reiki practice and continuing to grow and improve and spread my wings, even at my age. Thank you so much for waking me up and giving me great ideas and purpose. Your suggestion to look forward and visualize what my practice will be in 6 – 12 months fits nicely with my own philosophy of bringing things to fruition in my life. It helps to be reminded each of us are responsible for what happens in our lives. It is too easy to take things for granted and forgo vision of what will be. The successes I have had in life uses this principle for manifesting what one wants. Sooo happy to read this, Karen, and I look forward to hearing where you go with it. Haven’t read Canfield’s book, but love the party idea! Thanks for sharing it.